Providing fun-filled family adventures for over 100 years, the National Park Service succeeds in touching the hearts of anyone who steps foot in the system’s numerous parks. While they are best known for their summertime activities, the winter season offers unique experiences for everyone to enjoy. 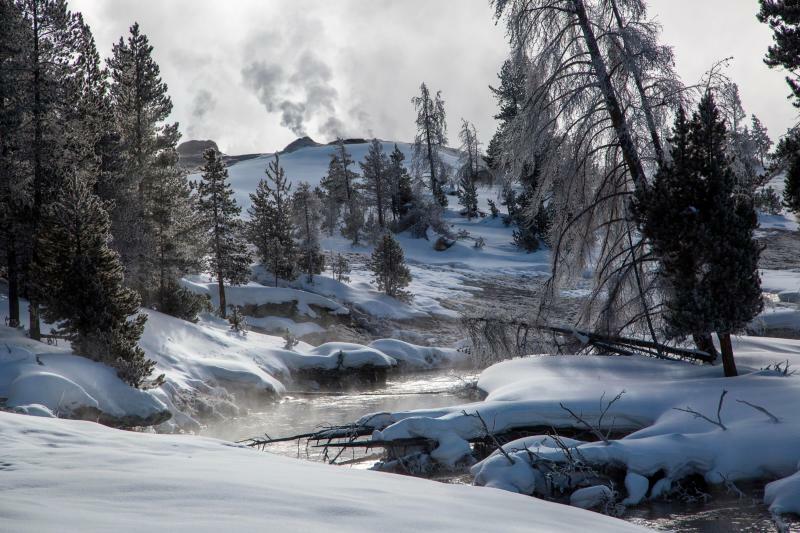 Spanning through Wyoming, Montana and Idaho, the world’s first national park doesn’t fall short when it comes to winter activities for the whole gang. Whether your family loves action-packed adventures or relaxed activities, there is something for every member to enjoy. Mammoth Campground offers a unique winter camping experience suitable for all ages. Skiing and snowboarding at Mammoth Hot Springs Upper Terraces is an option for those in the group who crave an adrenaline rush. No need to worry about bringing your own gear, as they have a rental program. If staying indoors is preferable, sitting by the fire at Old Faithful Snow Lodge is an option. Heard of the Junior Ranger program? An interactive booklet, available at the Visitor Center, is aimed at the young adventurers who are four years old and above. Additional activities include watching Old Faithful erupt, searching for wolves in the Lamar Valley, dog-sledding or participating in Yellowstone’s Young Scientist program. The activities continue at night, as the entire clan can enjoy their time together gazing at the stars. 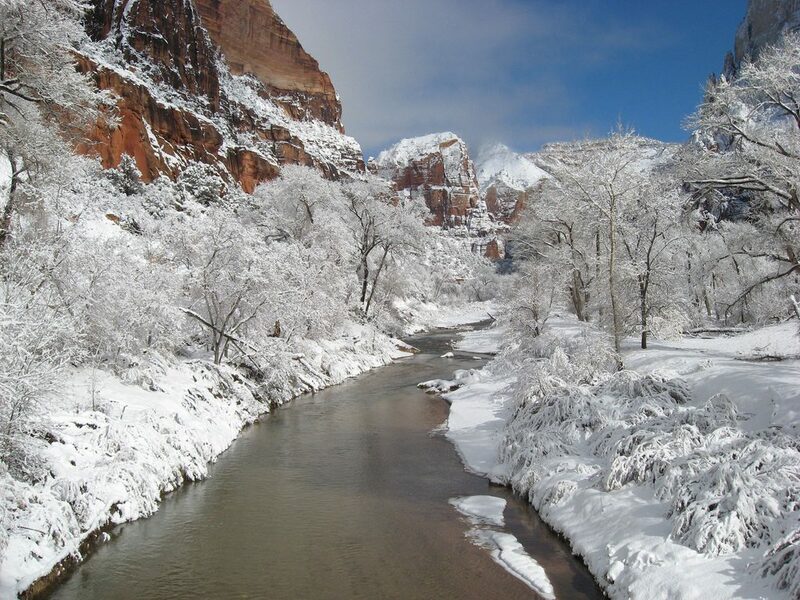 Utah’s first national park has winter activities fit for the whole gang. Look into the easy to moderate hikes that are available in the winter months, such as Weeping Rock, Emerald Pools and Riverside trails. Take the clan into the car for about a six-mile scenic self-guided drive, which provides a great view of Zion Canyon. On the way, there are areas to park the car and go on short hikes with photo opportunities. Make sure to ask the park rangers where the best places are to view the wildlife, as winter provides an opportunity to catch sights of wild turkeys and bald or golden eagles around the park. Check out the Visitors Center, where activities such as movies and the Junior Ranger program are available for children to discover more about the park. The Zion Nature Center also offers interactive activities for the kids to enjoy. 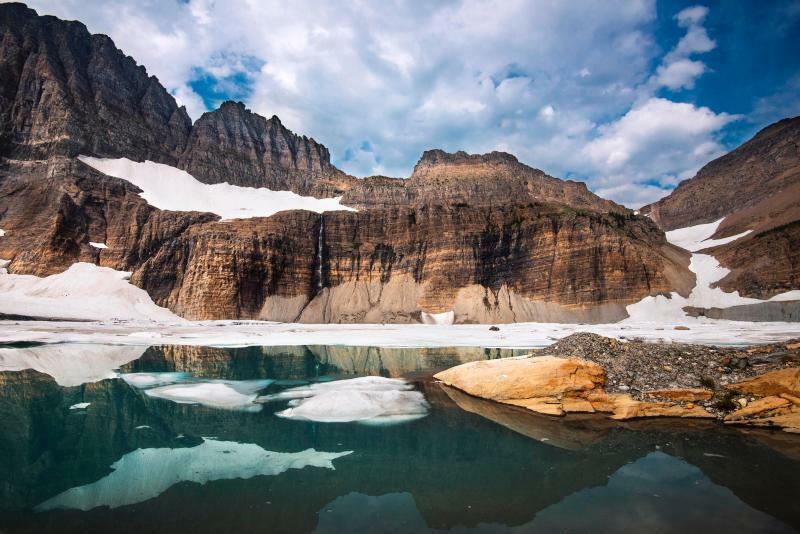 Reaching over one million acres, northwestern Montana’s Glacier National Park is located on the U.S. border with Canada. This national park doesn’t fall short of fun-filled family activities. Skiing, snowboarding and cross-country skiing are available as soon as there is enough snow. Winter camping is open at certain sites for those wishing to brave the cold. Snowshoeing with ranger-led tours throughout the winter season is also an option. Check out the Discovery Cabin in Apgar Village, where the gang can learn from the education stations. The Junior Ranger program is available for children of all age ranges. 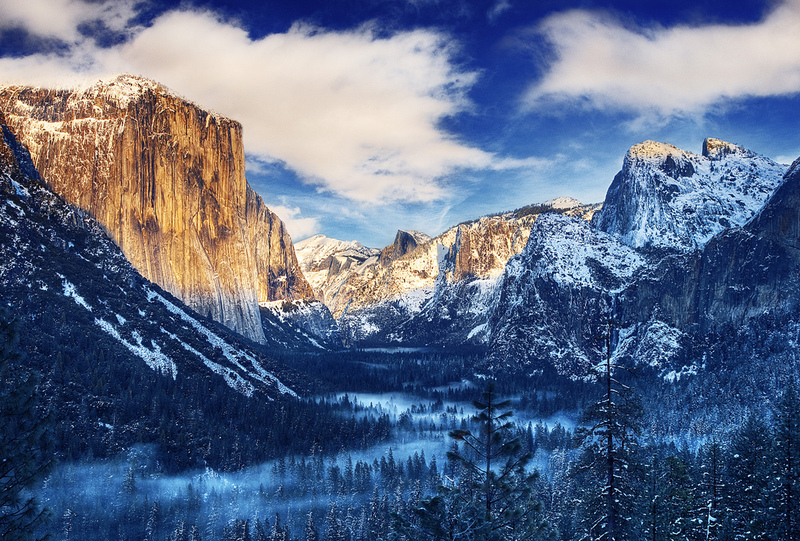 This California-based national park offers a wide range of winter activities for the gang. The park, about the size of Rhode Island, is accessible year-round by car, but tire tracks are required for most of the roads. This expansive family-friendly park has activities for groups of all sizes. Take a trip up to the Yosemite Ski and Snowboard Area, which is available for ski and snowboarders. Considered a “must-see,” Yosemite Falls is the tallest waterfall in the park and is almost always flowing consistently in the winter season. Most Yosemite Valley trails are still open and available for hiking during this time. The Junior Rangers program is an option that provides children with the ability to learn about Yosemite’s unique history. A fun before dinner activity is offered at the Ahwahnee Great Lounge, where the group can sit around sharing stories at Fireside Storytelling. Known for its giant redwood trees, Sequoia National Park attracts visitors year-round. Don’t be fooled by the California location, as winter is the longest season in Sequoia, normally spanning from December through April. Sled down the hills at the Grant Grove and Wolverton recreation areas or snowshoe and cross-country ski at the available areas scattered throughout the park. Interested in a ranger-led snowshoe walk throughout the park? No experience or gear is necessary, as the guides provide all the equipment. Available for children as well, the snowshoe walks are reservation only. If snowshoeing without a guide is preferable, most of the trails are suitable to explore by yourself or with your gang. Looking to see the scenery? 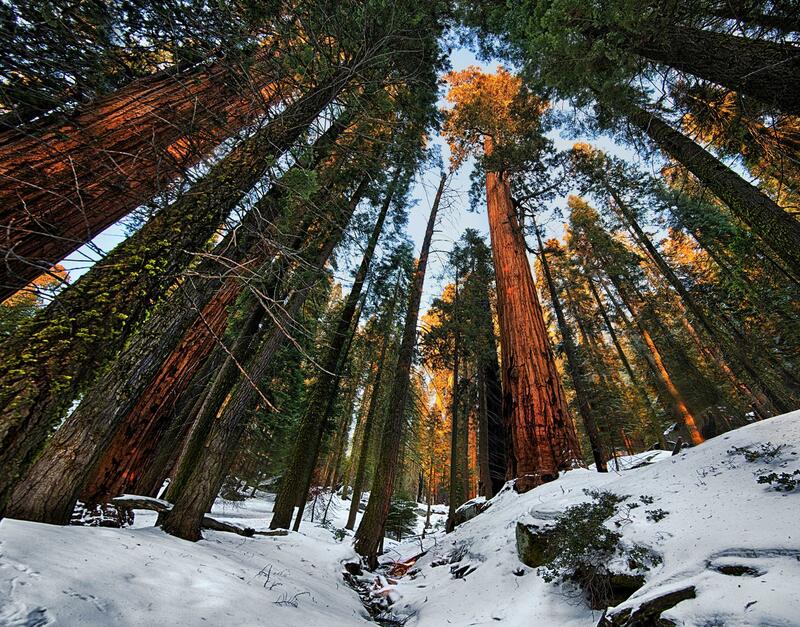 The Sequoia park service offers self-guided winter drives with a list of must-see viewpoints. Winter camping is available, as three campgrounds are open during the winter months that offer the basic amenities such as restrooms, food lockers and fire pit rings. Located on the coast of Maine, Acadia was the first established national park in the eastern part of the United States. Home to the tallest mountain on the Atlantic Coast, the park is known for its history and scenes. With over 45 miles of trails available, Acadia offers countless trails for cross-country skiing or snowshoeing. Winter conditions shut down most of the roads throughout Acadia, but two scenic drives, Ocean Drive and Jordon Pond River, are available year-round. Activities for the clan include snowmobiling for the thrill-seekers of the group and winter hiking. Make sure to check the forecast for the day, as some trails may be closed. Winter camping is always an option, as the Blackwoods Campground offers a limited amount of open campsites. The Junior Ranger Program is available for kids of all ages. Interested in trying a new activity? Skijoring, an activity where the person is on skis and is pulled by dogs or horses, is available to try out during the winter season. Dog sledding is another option for those who would like to interact with the animals while seeing the sights. 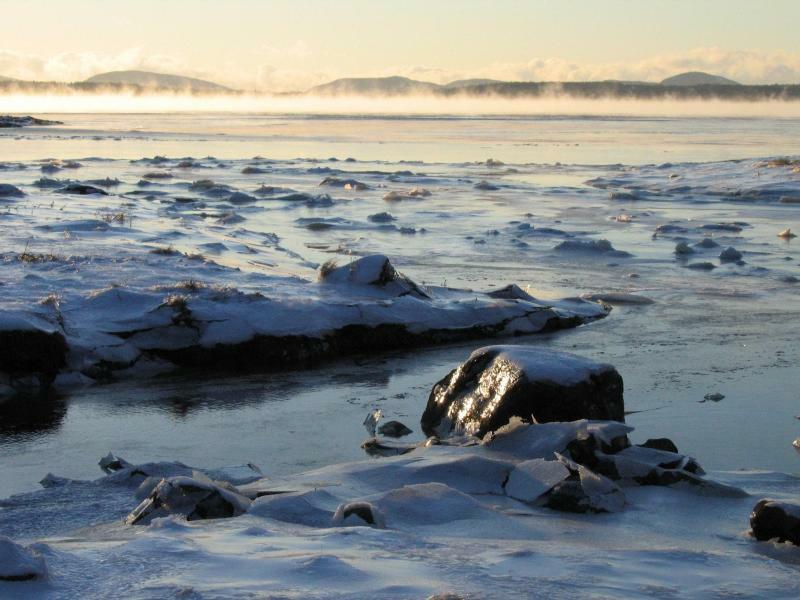 In February, Acadia National Park hosts the Acadia Winter Festival, which offers various activities for the reunion. This is just an overview of what is available at these six National Park sites. For more information, visit https://www.nationalparks.org. Make sure to check out “Every Kid in a Park” pass. Available through August 31, 2017, every kid in fourth grade will have free access to the national parks of their choosing. Opportunities are endless for student-friendly activities in the Treasure State. Being the first state to grant women voting rights and home to Yellowstone National Park, Wyoming teaches students more than the average classroom could.